Last Monday, I made an appointment to go and see my chiropractor for an adjustment and accunpuncture session. If you are local and looking for a chiropractor be sure to check out Spine and Disc Center of Arizona and schedule a visit with Dr. Jason Taylor. Josh and I have been going here for adjustments and massage for the last 10 years. With my due date coming up in two days I knew it would be beneficial to get an adjustment before labor. Plus, I was also hoping that the focused acupuncture session would encourage labor to start. I dropped the kids off at my parents house before heading over for my appointment at 5pm. By 6pm I was back at my parents house after having had an adjustment and an acupuncture session. Up until this session I had only been having inconsistent contractions and nothing that was indicative that I would be going into labor soon. I called Josh at the fire station and let him know to keep his phone nearby just case I went into labor. The kids and I got in the car and arrived home by 6:30pm and they were sleeping by 7:30pm. I started to feel more achy decided a shower and bed would be a wise idea. 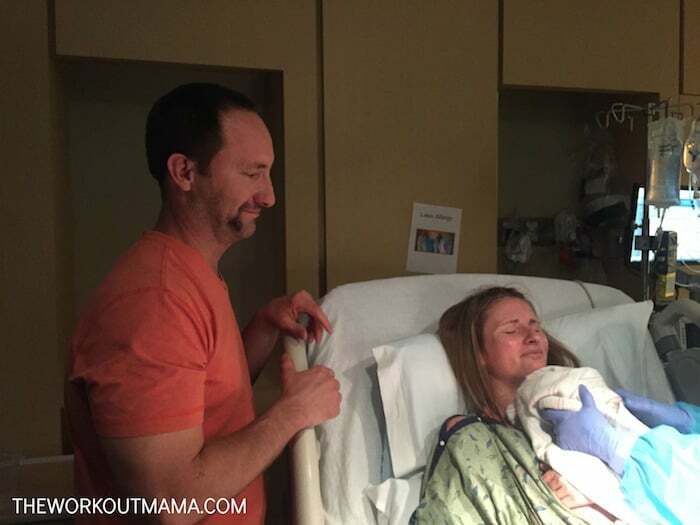 Between multiple trips to the bathroom and resting in bed I began having more contractions. Nothing horrible yet but the frequency was increasing. Soon after midnight on Tuesday November 15th I went to the bathroom yet again and when I went to wipe there was bloody show. Yay! This meant I was getting closer to being able to hold our baby. But also at the same time, eeekkkkkkk, because I was getting closer to all the things that happen before you can hold the baby. By 3:15am I called Josh and told him to come home. It took several phone calls to reach him due to the fact that he was in such a deep sleep because he had got himself all pumped up after our last conversation, ran two calls, and finally had been able to close his eyes. He was home by 4am. And by 4:30am my parents were over at the house to stay with Caden and Maisie. I finished up a few more things around the house, took another shower (because showers feel good when you are having contractions), and double checked my hospital bag. Josh and I arrived at the hospital and sat in the parking lot for 45 minutes. Josh convinced me that we should probably get out of the car and go get checked in. When we were being checked in Dr. Brass, my OB, was walking out of the labor and delivery area. I am counting this as an unexpected blessing from God. With Caden and Maisie she arrived right as I was ready to push but it was amazing having her already at the hospital! At 6am I was in the triage area and was told I was dilated to 3cm. Not the best news but on the flip side Dr. Brass was able to strip my membranes. In an hour I would be checked again to see if I had progressed. 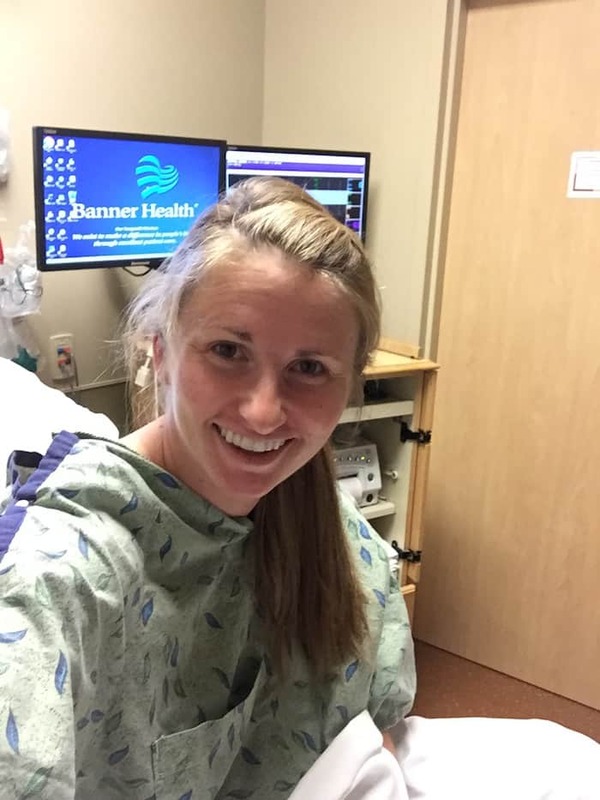 During this time I made multiple trips to the bathroom, if you have been in labor before you know you pretty much release anything that is inside your body, and started to have an increase in the pain and frequency of the contractions. When the nurse checked my an hour later I had not made any more progress and was still at 3cm. She could tell that my contractions had increased and went to talk to Dr.Brass who to my surprise said I could be admitted! Praise Jesus! I was so happy I didn’t have to get back in the car and go home. Can you tell by my face how excited I was? It is also obvious to note that in this picture I am still smiling, I also still wanted to take a picture, and I texted it to several friends to give them an update. This was my only selfie of the morning. Josh and I got setup in the labor and delivery room by 8am. I was hooked up to monitors, an IV, and given a birthing ball to sit on. I sat on the ball in between contractions and stood up and leaned against the bed during them. My mom arrived shortly after and she and Josh would press down on my low back and sacrum during the contractions to help with back labor. With all my kids I have intense pain in my lower back with contractions. My nurse came in and asked if I would like Dr. Brass to break my water. Umm, yes please! I was actually kinda excited to have her break it because Caden and Maisie’s broke on their own and I wanted to experience what it felt like. Spoiler alert: It feels exactly the same as when it breaks on it’s own. The only difference is you know that it is coming. Before she broke my water she also checked me again and I was 5cm dilated. The time frame that follows starts to get a little blurry because everything happened so fast. After my water broke I was sitting at the edge of the bed to drain out and things started to get a lot more intense. I couldn’t talk or carry a conversation in between contractions, I was literally just trying to focus on getting through the contraction before the next one started up. While I was sitting on the edge of the bed I became super nauseated and vomited multiple times. Multiple times. It wasn’t fun and I am very thankful for Zofran. By 9:30am I was checked again and I was 6cm dilated. I went from sitting up to laying on my side with a peanut ball in between my legs. It felt pretty amazing at that point to be totally relaxed on the bed and not having to support my weight. Dr. Brass came back in again and suggested that I try getting on my hands and knees at the top of the bed. During contractions I would sit back towards my heals, like a modified childs pose and began to feel soooooo much pressure! The nurse asked to check me again. This is probably the worst part of labor. When you are in the middle of back to back contractions and need to be checked on progress. Shockingly I was 10cm dilated and was ready to push! Couldn’t believe it but was so thankful! The squat bar was setup at the end of the bed, Josh got his gloves on to catch and I was given the go ahead to push. If you have never heard of delivering a baby in this position I highly recommend it! I describe it in more detail in Caden’s birth story and also mention it in Maisie’s birth story. My body loves the pushing part of labor. It is this sweet yet intensely painful moment that is filled with the excited anticipation of what is to come. At 10:22am after 4 minutes of pushing our handsome son, Jesse Tate, made his way into his Daddy’s hands and was then placed on my chest. I was admitted at 7:30am and Jesse was born at 10:22am. In less than an hour I went from 6cm to fully dilated and delivered our son. It amazes me what my body is able to do. It seems fitting that this week is Thanksgiving. I have so much I am thankful for. I don’t think I can ever truly express how grateful I am to have the opportunity to be a new mom again. Childbirth is a very painful, yet transformative process. I don’t think you can go through labor and delivery without coming out changed on the other side. During labor with Maisie I kept saying to myself over and over “This is the last time you have to do this, Tam.” The pain was so intense that the only thought I could grasp ahold of was that Josh was getting a vasectomy and she was going to be our last baby. With Caden I had no clue what labor was going to be like. No clue. When I was barely dilated at the hospital after my water broke and eating a popsicle I heard another woman giving birth next door screaming. I couldn’t fathom why she was making those noises and literally was thinking that she needed to get it together. All that to say that after giving birth three times without medication I totally understand those noises that other mama was making. During labor with Jesse I kept quoting scripture over and over to myself and praying Philippians 4:5-7. Over the past two years I have learned to release myself from having to be in control, because ultimately I am not. When I tried to control things or prove to myself that I could handle whatever life brought my way I sunk deeper into my own anxious thoughts. This last year has really shown me that what I say I believe is what I actually believe and who I say is in control of my life is actually in control of my life. In the last year Josh and I have gone from thinking we were done having kids, to deciding to become foster parents, and to finally learning that we were surprisingly pregnant a year after his vasectomy. If this had happened two years ago I would have seriously questioned God about what was happening and would have been an overall mess. Jesse means gift. Josh and I believe that all of our children are gifts to us but this little boy has especially made this seem even more true. He is the best gift we never knew our family was missing and now that he has arrived I can’t imagine our family without him. God has been so good to our family and this unexpected blessing has been a beautiful testimony to His goodness and grace. 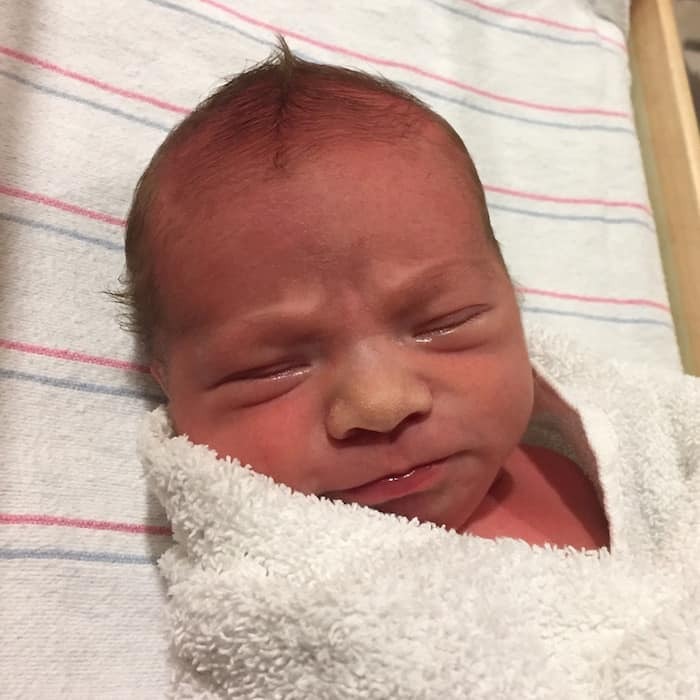 I love birth stories!! Progressing so quickly from 6 to 10 is super intense! I always tell my doula clients that think they want rapid progression that it isn’t all it’s cracked up to be. It’s hard! Congratulations on your sweet baby!! Hi Tamara and Josh! (Belated) congratulations on the birth of your son, Jesse! I am catching up on my blog reading and your Joovy post mentioned Jesse. Oh what a gift he is from the Lord! Happy Holidays to all, and blessings! I randomly thought of you in church today, and thought, “She’s had her baby by now, right? !” And then I read this. Congratulations, mama!